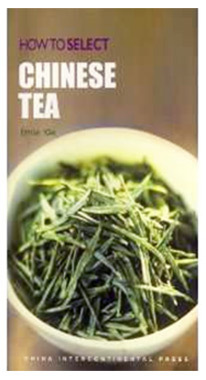 Produced ahead of the 2008 Beijing Olympic Games, How to Select Chinese Tea is an insight into how tea represents Chinese culture as well as a buying guide for our favourite leafy commodity designed specifically for tourists and newcomers to Chinese customs and products. As author Ernie Xie notes in his foreword, the overarching aim of the Beijing Olympics was to show the world how progressive China is, but “there are still a few who are proud enough of China’s dusty, old, low-tech treasures”, hence this and other books in the series on jade crafts and embroidered art. The guide begins primarily as a crib book on Chinese history through the consumption of tea—from medicine to emperor’s cup, Buddhist beverage to libation of the people—but then becomes a solid buying reference, from its short profiles of China’s most popular teas and what you can expect to pay for them, a chapter on teaware, the Chinese tea ceremony and brewing methods and a third of the book devoted to an overview of Beijing’s best known teahouses and tea shops. As a guide it’s set out well and provides sufficient information for the interested amateur without getting too taxing or technical in its detail. The most interesting parts cover the history of the teahouse in China as a place to socialise, do business and compete in tea contests and its reviews of Beijing teahouses is informative and an excellent primer of what to expect when shopping for tea. There’s really only one wrong note in the book, but unfortunately it’s a loud clanger: the chapter on ‘Categories of Tea’ is mostly composed of factoids about how good drinking tea is for your health. While Xie does his best to include as many references to peer reviewed medical studies as possible, the flow of this chapter comprises too many bullet points and throwaway lines about the health benefits of tea that it comes off clunky and unconvincing. Strangely enough this segment ends with some information about the cultivation of tea and the tea-growing areas of China when surely this information should have preceded the section on tea profiles. Verdict: Overall it’s a handy guide and a good signpost for those who might want to find out more about Chinese tea, whether ready to purchase or simply curious about the role tea plays in China’s history and culture. This entry was posted in books and tagged book, China, review. Bookmark the permalink.